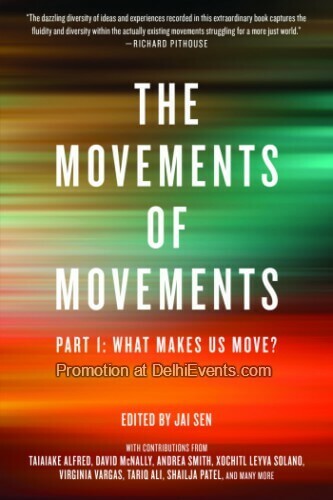 Event Description : The book launch of 'The Movements of Movements : Part 1 : What Makes Us Move? ', edited by Jai Sen is been organised by CACIM (India Institute of Critical Action Centre in Movements). The book has been published by Authors Upfront, PM Press and OpenWord in India. An international version was published by PM Press and OpenWord in USA. Book release will be followed by comments on "Current state of the movements in the country and all around the globe” from speakers. About the book: What Makes Us Move?, the first of two volumes, provides a background and foundation for understanding the extraordinary range of uprisings around the world: Tahrir Square in Egypt, Occupy in North America, the indignados in Spain, Gezi Park in Turkey, and many others. It draws on the rich reflection that took place following the huge wave of creative direct actions that had preceded it, from the 1990s through to the early 2000s, including the Zapatistas in Mexico, the Battle of Seattle in the United States, and the accompanying formations such as Peoples’ Global Action and the World Social Forum. About the Editor: Jai Sen, associated with the India Institute for Critical Action: Centre in Movement (CACIM), is an activist, researcher, and author on and in movement. He has intensively engaged with the World Social Forum and contemporary emerging movements on a world scale, as moderator of the listserv WSMDiscuss and as co-editor of several books including World Social Forum: Challenging Empires and World Social Forum: Critical Explorations. Dr Vasundhara Jairath - academic - activist teaches development studies at IIT Guwahati. About the Organization :CACIM (India Institute for Critical Action Centre in Movement) is an initiative towards cultivating and nurturing a culture of critical reflexivity and action in individual and public work. It sees critical thinking and reflection, and critical engagement, and though this critical action, as contributing to broader and more effective transformational social power. We primarily work by building and maintaining real and virtual spaces for fundamental research and critical reflection, exploration, action, and creation in the field of movement: books, seminars, workshops, websites, listserves, and news bulletins and action alerts. Initiated in India in 2005, CACIM is transnational, intercultural, and interdisciplinary in its vision and culture.